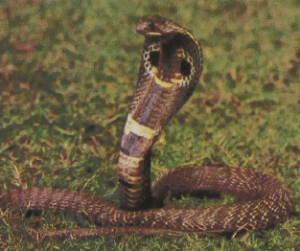 This cobra and its relatives range through the land areas of eastern Asia from Iran to China, south to Sri Lanka (Ceylon), and north to Russia. Other species of the genus occur in Africa, which is truly the home of cobras since it contains far more kinds than all of Asia. When disturbed, they raise the anterior portion of the 6-foot body and spread some of the ribs, forming a hood. 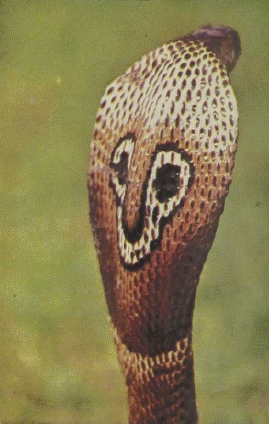 The back and front of the hood may bear different designs, such as the pair of eye spots on the back of the Indian Cobra. Since the strike is downward and forward, the height to which the hood is raised gives some indication of the distance of the strike, allowing snake charmers continuous information on how to stay out of reach. The flute often used by such performers affects the audience more than the snake, which hears well only in the low range up to 1,000 hertz.